Despite appearances, this is not a mutant tree wētā. The coils emerging from the rear of the wētā belong to one or more Gordian (or horsehair) worms. 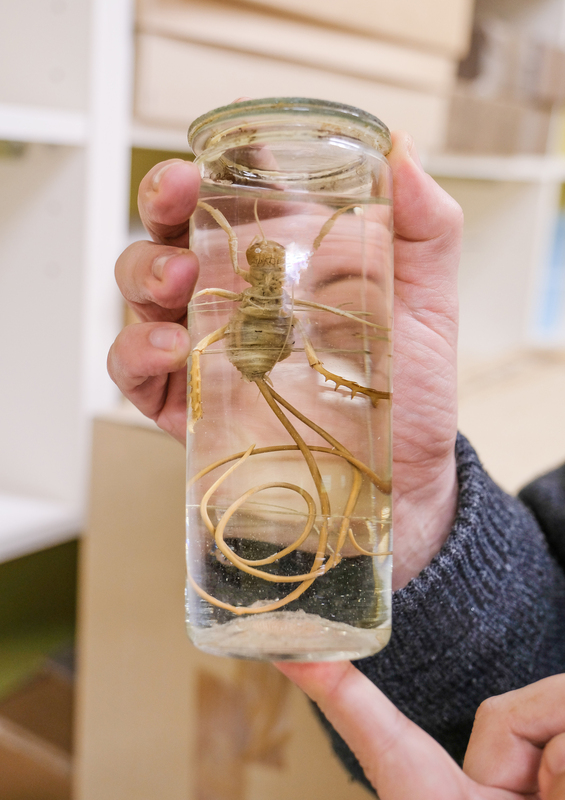 Bug expert Dr Phil Sirvid explains the bizarre behaviour of this parasitic worm and why this specimen is a tour favourite. We don’t have any information about where this particular specimen came from, but we do know it has been part of our collection for at least 50 years. It’s not the only specimen we have like this, but it’s a lovely example of its kind – if lovely is the right word to use! We often show it when we are doing behind the scenes tours and it never fails to get a reaction, particularly when people hear the story behind what they’re seeing. What has happened to this weta? This is a tree wētā (Hemideina sp.) with one or more Gordian worms emerging from its rear end. The worm is probably a species called Parachordodes diblastus (previously known as Gordionus diblastus) as tree wētā species are its preferred hosts. Other wētā species are infected by other kinds of Gordian worms. Gordian worms, also called horsehair worms, belong to a phylum of animals call Nematomorpha. While the adults are free-living worm-like creatures that live in freshwater, they all have a larval stage that enters a host (usually an insect) and grows and develops inside it. The larvae absorb nutrients and as you can see from the picture, can grow to a great length that is somehow packed tightly into the host’s body cavity. How larvae get inside a wētā is still uncertain. George Poinar, a world authority on these animals, has suggested that it may happen when a wētā feeds on the dead body of an infected intermediate host (i.e. another species that may contain larvae but that the larvae doesn’t develop in). However, we also know that wētā sometimes drink from free-standing water sources and that may be another way for the larvae to enter. If all this is sounding weird and perhaps a little horrifying, there is more to come! After about a year, the adult worm is ready to emerge. It triggers something in the host’s brain that makes it seek out water, which is where these worms live and reproduce. Quite how it creates this drive to find water is a mystery, but that’s going to be the last thing the wētā ever does. If the wētā doesn’t drown, the emergence of the worm will be fatal. Who needs the Alien movies when we have creatures like this in real life? Such a good read, thank you! good to see you are still checking out cool critters. I found one last summer in the waterfall at waipapa on Lake Taupo. The kids thought it was cool! Hi Graeme, thanks for the comment, and it was pretty neat you were in the right place at the right time to see one yourself. I only ever see dead ones. The last time was when a worm was trying to emerge into a puddle on a road and both it and the weta had been run over!